Last year, we said it was tough finding great comedy movies to pick for our top ten. This year it was even tougher. But there were a few gems. Deadpool, which starred Ryan Reynolds and T.J. Miller was the first R-rated comedy superhero movie, and it crushed at the box office. Sausage Party also had big success taking a genre typically relegated to children’s movies- animation- and giving it a dirty R. Also in the crowd pleaser zone, a few action comedies, Kevin Hart and the Rock teamed up for one, and Ryan Gosling and Russell Crowe for another and this was the year that four of the funniest women in comedy starred in Paul Feig’s reboot of a franchise favorite. A few indie comedy movies from renown directors- the Coen Brothers, Richard Linklater, and Whit Stillman put out top ten worthy comedy films. Add in a record breaking stand up performance released as a feature film on a giant budget from Kevin Hart with a cast of tens of thousands (if you count the audience as cast), and a one person show that wasn’t even supposed to be a comedy to round out the ten. 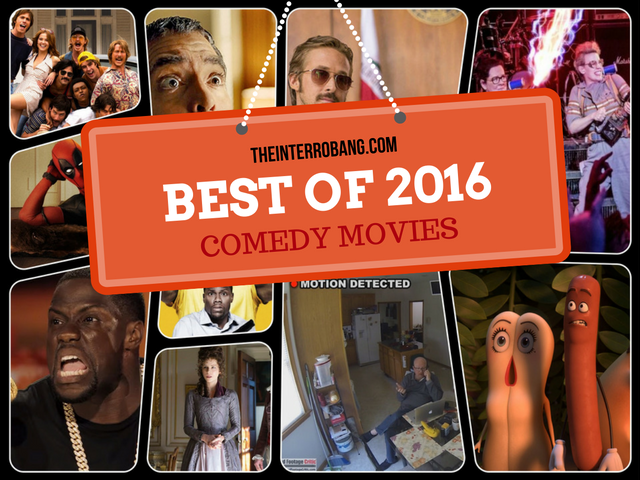 Now it’s your turn to vote for the #1 comedy movie of 2016. In 2014, Wes Anderson’s gorgeous Grand Budapest Hotel took the honors in this category. Last year, it was Amy Schumer’s Trainwreck that got your vote. Who takes the prize in 2016? This animated movie finally asks the question, what are food really thinking at the super market? This Seth Rogen and Evan Goldberg project is a hilarious spoof of those Pixar/Disney movies you’ve “had to see” because of the kids in your life, they even went as far as getting Alan Menken, the man behind many of the famous Disney movie songs to write something for this. Just a few of the comedian voices featured are Nick Kroll, Kristen Wig, Danny McBride and Jonah Hill among a ton of others. This buddy comedy directed by Shane Black stars Ryan Gosling and Russell Crowe and is set in Los Angeles in 1977. Russell Crowe plays a tough guy enforcer who is forced to work with Gosling’s private-eye after a woman claims to have seen her actress niece even though she died in a car crash. The movie is a surprise laugh out loud comedy from two guys you don’t get to see do comedy that much and comes off like the pilot of a show you definitely would have loved to see in the late 70’s like Starsky & Hutch or The Dukes of Hazzard. The big comedy cameo in this one is from The Comedy Store, which Crowe’s character lives above. With the overflow of superhero movies flooding the genre it was only a matter of time until we got a satire and Deadpool was the perfect superhero for the job. Being that in the comics Deadpool constantly broke the fourth wall and made fun of himself and other heroes, it only made sense he do so in the movie too and that is why Ryan Reynolds was so motivated to get this movie made the way it deserved after almost killing the character in Deadpool’s debut film in the first Wolvervine movie. Deadpool also featured a memorable supporting role from T.J. Miller playing the “Merc With A Mouth’s” buddy/bartender. The Coen Brothers movie of 2016 was a comedy about the 1950’s Hollywood studio system and starred Josh Brolin as a heavily fictionalize version of real life fixer Eddie Mannix. Mannix has to deal with a secretly pregnant and un-wed starlet (Scarlett Johansson), the star of the studios Rome epic feature is missing, (George Clooney) with some funny performances from Channing Tatum and Jonah Hill as well. This movie about a kid showing up to his first day of college in 1980 ready to play baseball has connections to two other Richard Linklater movies, one is Boyhood which ends with a kid showing up to college and the other is Dazed and Confused which also has a pitcher character entering high school in 1976. The movie takes place over the first college weekend and shows the team going to different bars and clubs of the time trying to figure out what scene they best belong in. It’s another classic Linklater film that just follows a group of people’s lives, it doesn’t need some big ending or intense plot, it’s just a slice of life with some real great laughs along the way. The two hardest working men in show business right now are Dwayne “The Rock” Johnson and Kevin Hart and this movie is basically a contest between the two to see who has more charisma. The two obviously got along real well because they have already finished filming their next movie together, Jumanji and it may just be the smart of this generation’s go to comedy team. The Rock plays a former fatty who is now a CIA operative who needs help from his old high school buddy played by Kevin Hart, a washed up high school track star who needs some excitement in his life. Who does it bigger and better than Kevin Hart? Well he’s outdone himself this time with his Concert Movie: What Now?, which boasts the accomplishment of the first time a comedian has ever performed to capacity at a football stadium. Kevin Hart proves again in this special how entertaining he is as a storyteller and that he was not brought down by a problem a lot of comedians have when they make it big, staying relatable. Writer-director Whit Stillman makes a strong return to the silver screen with a period piece comedy, Love & Friendship, adapted from a Jane Austin novella. A debutante’s life, which Stillman has always had a knack for exploring, may seem stuffy and dry, but the film is anything but. Shockingly wicked comedic performances by Kate Beckinsale and Chloë Sevigny and a scene stealing absurdly funny role for Tom Bennett make this film an easy contender for one of 2016’s funniest features. The third Ghostbusters film was without a doubt one of the most anticipated and talked about films of the last few DECADES, and director Paul Feig along with his cast – Melissa McCarthy, Kristen Wiig, Kate McKinnon and Leslie Jones delivered. Any time you reboot a movie franchise as beloved as Ghostbusters, it’s going to be hard to do. One huge compliment for them was the blessing of the original cast the entire time. One small film, that comes to us by the way of South Jersey and Amazon Prime, has taken the internet by storm. Written, directed, produced, and acted by one Nigel Bach – Bad Ben is a modern horror-comedic masterpiece. Can anything beat this film in 2016? Doubtful. Do yourself a favor and watch Bad Ben, leave a five star rating and tell Nigel Bach how much you love it. Because there’s no other way to experience it.